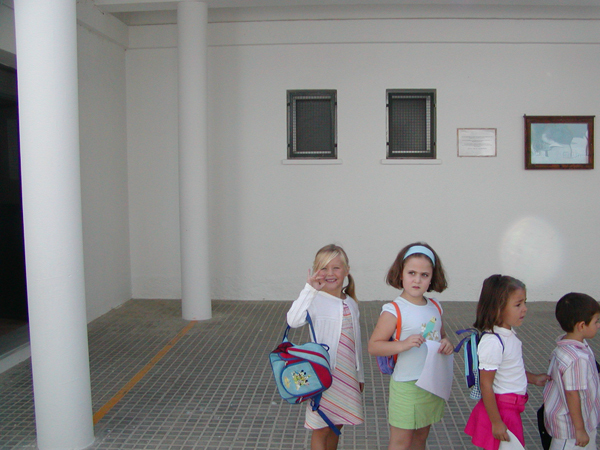 Thea, 1st school day in Vejer. Thea & David have started their school years very differently. Thea, as the oldest, started already 2 months after we arrived to Spain. A couple of concerned neighbours came by and asked if it wasn’t best if our daughter joined their little village school. She was almost four years old and children in Spain start when they are three. We talked to Thea about it and she thought it sounded cool, that she was old enough to go to school, so yes, off she went. As mentioned it WAS a little school. Thea was the fourth girl out of…. well yes, four children in total. ;-) Their teacher came and picked them up in his car at 8:45 and returned them at 13:30. She was happy, but did not understand a lot. After almost 2 months of school their summer holiday came up. After the summer, we were informed, that two of the girls would be old enough to join a bigger school nearby. But that meant that there were two children left (Thea included!! ), since no other was starting. We decided, that it might be better for Thea to get know some more children and therefore enrolled her in a bigger public school in Vejer. It was really hard the first day, where we had to kiss her goodbye by the school gate knowing that we couldn’t be there for her the next five hours. She was now all by herself amongst a lot of strangers and she did not understand much of what they were saying. But she was all smiles and cheerful when we picked her up and she had a great year at that school. The year after we moved her again!!! This time to another school also in Vejer, but it had bus transport for all the children living in the countryside. We had now bought our house and moved to Patría. The bus stopped just in front our house and all her friends from our village joined that school. We wanted her to be as much a part of the community as possible, so we enrolled her in the third school within two years, but it was a hard decision. Again Thea didn’t seem to be bothered by the change. She has always been adventurous and very independent. She quickly made a lot of new friends. She is now in the Vejer Intituto; the school from 12+ years. The pupils from the two public schools of Vejer are joined together, which means that Thea is reunited with some of her friends from her first school years.